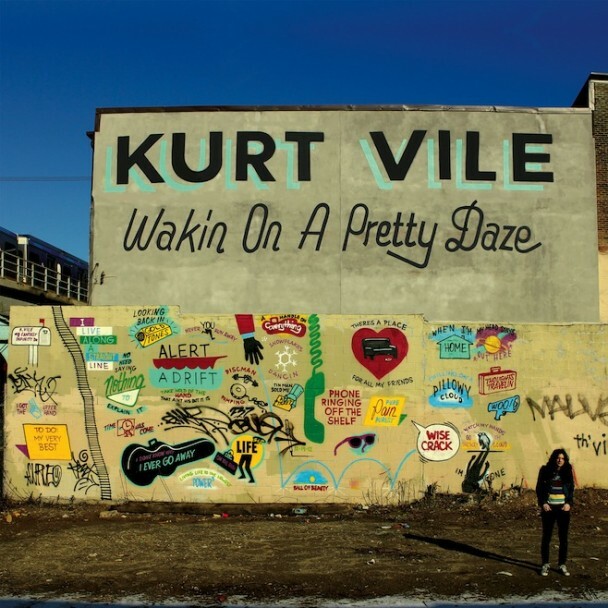 Kurt Vile is doing everything right. He’s a breath of fresh air since folk music has become a popularized-morphed version of itself. Vile’s new record Wakin On A Pretty Daze is charming. It’s loaded. It allows me to write cliche sentences like, “you’ll get lost in it” and “it’s full of daydreams.” But you will get lost in it and it is full of daydreams. It will let you forget about work. And school. You’ll just play. Maybe it’s the arrival of spring and maybe it wouldn’t have the same effect with a December release, but Pretty Daze is a soundtrack for the season. It makes me want to sit and stare into the spring, and then the summer night. If I had a car, I’d drive around listening to it all weekend. And if I was making a film, I’d put it in my soundtrack. The guitar is glowing with reverb and the small synth features (on “Air Bud” [below] and my god! the acoustic guitar detail at the end!) will catch you off guard, when you catch it. The album isn’t top heavy or better in the end, it’s great all the way through. Thankfully we still have The War On Drugs, but Wakin On A Pretty Daze is proof that Vile did the right thing by walkin’ away. Two years ago, I got to see Kurt Vile. He was opening for Thurston Moore at the Black Cat in Washington, DC. Moore was out touring his 2011 solo record, Demolished Thoughts, and Kurt was supporting his (duh!) excellent Smoke Ring For My Halo. The story goes: I thought I had a ticket when I didn’t. And after testing my patience – and theirs – the managers ended up letting me pay the $15 ($15!) to take the place of someone who didn’t show up. The place was mobbed and Sonic Youth fans – some of my least favorite kind of fans – were everywhere. By the time I snuck up to the front of the stage, Vile was just getting settled and you could barely see through his hair. He sat while he played. And I knew I had made the right decision in nagging the Will Call Guy the third time to check for my name. It was a terrific acoustic folk show. (I ended up elbowing my way through the dirty looks during Moore’s drone opener. I love loud music and I love rock and roll. But I’m not game to stand around for 20 minutes of guitar feedback.) And it is also proof that, if you believe you have a ticket to a sold out show, you can get in. Vile is on tour now. If you can, catch him. Wakin On A Pretty Daze will be around forever. It’s full of “Never Run Away” and “Too Hard” showing and telling us how Vile is testing himself as a songwriter, one of the most honest of our time. His voice leans towards Lou Reed (they both have that talk-singer thing going on). And whatever is going on during the 10:26 album closer “Goldtone” is so fantastic that Vile is now also – officially – on my shortlist of Guitar Gods. Vile is a slim man, who seems shy. But his sound is so big. You can’t ignore it and you won’t be able to ignore this record. It’s too perfect.